Father's Day is coming soon. I thought I'd go ahead and share a few of our favorite Father's Day books. What books do you incorporate to make Father's Day a special day? Daddy Adventure Day I love this book about a boy's first trip to the baseball game with his daddy. 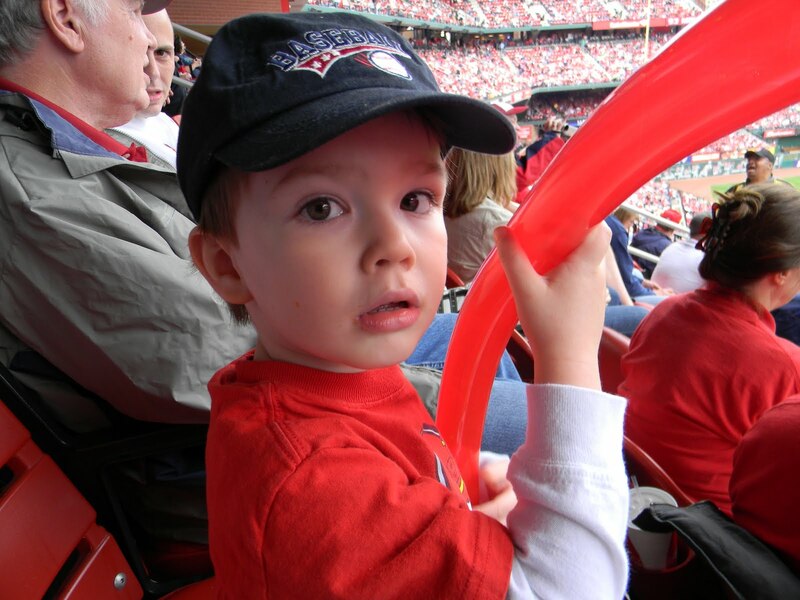 It reminds me of a certain little boy in my house who recently took a trip to Busch Stadium to watch the Cardinals with his daddy. Just Me and My Dad Greg bought this book for Logan on his first Christmas. It was one of Greg's favorite books when he was a child and he wanted to make sure Logan had it in his library. It is a sweet story about Little Critter and Dad's father/son camping trip. Check out my review of this book. The Father's are Coming Home This is a less "Lovey" story than many of the Father's Day books I'm drawn too. In this simple text, written by Margaret Wise Brown, animal daddies return home to their children. Interestingly, the lion lives alone-- which could be a good discussion starter about family dynamics both in the animal kingdom and the human experience. The illustrations have a "retro" feel to them. They aren't overly exciting but they work. I actually found this book a little boring when I picked it up at the library. My boys, however, have such a love of animals (and daddy) that this book worked for them! The Daddy Book As you have probably noticed, we all tend to parent in different ways. Also, parents may hold a variety of roles in a variety of households. This is a great book that celebrates the differences in daddy's yet brings out the importance of the similar roles that daddy's play. For instance, daddy's may do housework or office work but all daddies love to kiss and hug their kids. The illustrations are bright, colorful, and cheery! No matter the dad, you can't go wrong with this one! Me and My Dad This is one of those books that will build up that male ego! Your hubby will love reading this book with your kids since it is about all of the great and macho things that dad can do like running really fast and protecting his "cubs" from thunderstorms. The bear cub makes it great for a father/son relationship or a father/daughter relationship. Spot Loves His Daddy Both of my boys love Spot books but Tyson (16 months) seems especially drawn to them right now. He loves dogs. And points and says, "Woof, woof." This is a sweet book about all of the fun that Spot and his daddy share. Great for encouraging conversations about all of the fun things we do with daddy! All of these books are new to us.Thanks for sharing with us on Book Sharing Monday. My Dad by Anthony Browne is a beautiful book that we love. I see you got a Cardinals game in as well! :) Thanks for sharing these- I think my husband will enjoy it if I pick out some Father's Day themed books this week. Just Like Daddy by Frank Asch is very good too. These look good. Also check out Every Friday by Dan Yaccarino or Night Worker by Kate Banks.